1. 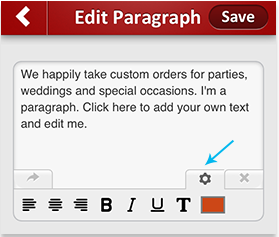 Customize text content. With all new templates we release we’re giving you the ability to completely personalize any text content on your mobile site. You can choose to make your text bold, italic and underlined, and you can also adjust the size of any text. 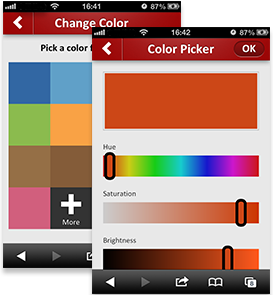 We’ve also given you complete control over the colour of text, including the hue, saturation and brightness parameters. 2. Switching Template. Ever got half-way through making a site then decided you don’t like the template? Us too, so we’re giving you the ability to change template at any time during the building process, whenever the feeling takes you. 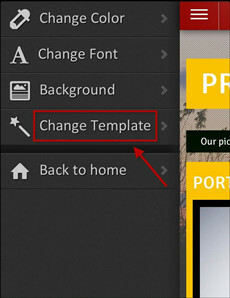 Simply click the icon with 3 dotted lines in the corner of the screen then select ‘Change Template’. 3. Changing Template Colour. Is the colour of the template you’ve chosen not quite doing it for you? Have no fear: with all newly released templates you can change the main template colour to give you the personalization and creative touch that you need. What's more, we’ve given you 14 default colours to choose from so you’ll never have trouble finding one that’s just right. Even if you can't find the one you want, you now have the ability to build your very own colour for your mobile site's template using the hue, brightness and saturation parameters. It's complete colour customizability! With these new features we've really ramped up the customizability of Joosee to provide you with many more choices and combinations when you're building your mobile site. We hope you have as much fun as we have playing around with these new features and applying them to your mobile site templates, and don't forget to give us feedback to let us know what you think!